For the woman whose “new year” begins in September, whose “Bible” is Vogue’s September issue and whose favorite season is “fall” (or “Wintour,” as we call it), there is a new website that will feed the fashion fetish year-round: www.ShopSeptember.com. The cyber destination, which officially launched in January 2013, showcases interactive shopping experiences, and so will this fashionable launch party! 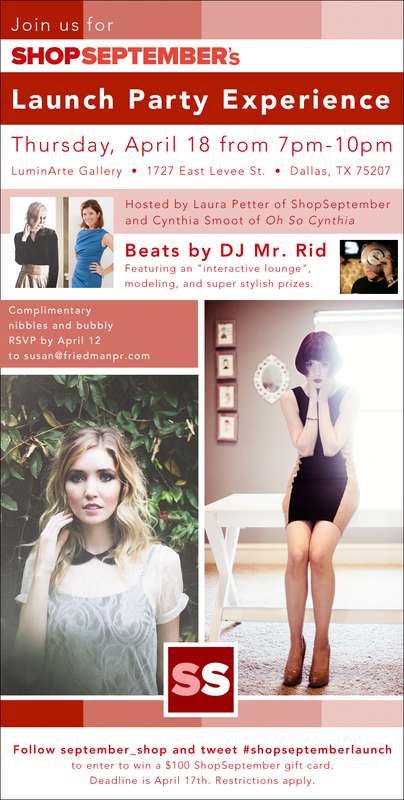 The event will feature an interactive lounge, “art fashion,” informal modeling, super stylish prizes, complimentary nibbles from Hypnotic Sushi, wine and champagne, and fabulous shopping! Guests have a chance to win a $100 ShopSeptember gift card prior to the launch party by following ShopSeptember on Twitter and hashtagging their tweets with #shopseptemberlaunch. Deadline is April 17th. Restrictions apply. ShopSeptember, launched in January 2013 by Dallas-based Laura Petter, is a trendsetting contemporary women’s apparel e-boutique featuring two different shopping experiences, The Showroom and The Street, both offering well-priced, fashion-forward garments. The Street gives shoppers a say in what looks they want to see and shop for on the site through polls, chats, and blogs, while The Showroom provides hard-to-find fashions by rising star designers. Head to www.ShopSeptember.com for more.